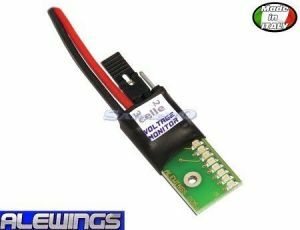 Voltage Monitor, battery charge indicator, programmable for 2 -3 IoLi - Li-Poli cells. The specific and essential device to verify at a glance, before every flight, the status of your battery on board. Only in this way, you can fly in total safety. Realized with high efficient diodes led, it can be used to monitor IoLi - Li-Poli accumulators and thanks to an easy manual set-up the same device can monitor accumulators of different cells. The weight is really moderate and the size of only 13mm x 29mm allows to position Voltage Monitor in every place of the model.